Rick Rickman is ready to rock! "Are ya up yet man?," whispered Rick as the clock struck 4. "Yeah," I mumbled. The sun had not yet risen and I found myself, once again, at Rick Rickman's house in Laguna Niguel. I hurried to put myself together and get ready for what would be an interesting trip. We had a 6:45 AM flight out of John Wayne airport into Dallas where we would then board another plane and fly to West Palm Beach, Florida. 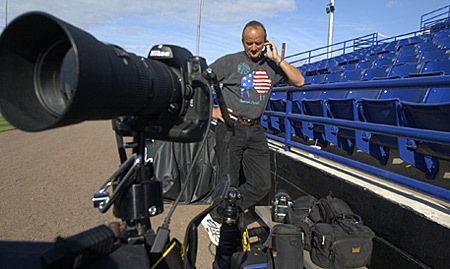 Rick had been assigned to cover the New York Mets spring training and naturally, as had been for the past 2 years, I would be assisting him. We boarded the plane after waiting in a security line, being strip searched, bag checked, magic wanded and flame broiled on a sesame seed bun. On the way over Rick and I both new there was something different about this trip. Turns out we were right. We got through both flights with no trouble except the usual jet lag feeling. Our hotel and the Mets' home field were in Port St. Lucie, Florida. It turned out to be about 40 miles away from the airport and with our trusty navigation system, that we later named Lucie Magellan, we had no trouble finding out where we were going. I had done many high profile shoots with Rick in the past, but none compared to this. Growing up I had always been a huge baseball fan and claim to be the same to this day. The Dodgers were always my team and I didn't really put it all together that I would be shoulder to shoulder with the likes of Mike Piazza, Todd Zeile and Roger Cedeno. I was thrilled. Our first game was an away game, and after jumping through flaming hoops to get our credentials (because naturally nobody from the Mets knew we were coming to cover the games) we finally got in. When we got to the Expos home field we set up our remotes almost immediately. That was my main duty for the trip; to fire the remotes covering home and second while Rick took different angles. After we set up our gear I followed Rick carrying the 600mm and another body with an 80-200mm. And then the clouds parted, out from the dugout walked Mike Piazza. I couldn't help myself; I had to let him know how great he was. After all he probably hadn't heard it in a few seconds so I walked up and said, "Mr. Piazza, I grew up watching you play and I just wanted to say thank you and that I really enjoy watching you play." Without breaking stride or stare he mumbled, "Yeah, thanks." I should have remembered all the times he refused to sign my ball that this would be a probable outcome. Rick later told me that saying that kind of thing to a player could get me thrown out of the game, so I decided to shut up and hold the lens. I watched the game for the first time through a professional photographer's eyes. It was amazing how literally beautiful a pitcher's windup can be, or the finesse of a diving catch can overcome a play. That night I got my first taste of combining two of my passions baseball and photography. Rick and I left the game having both taken some awesome photos. It was about 10:30PM and we wound up at Denny's in Port Saint Lucie. We made several trips back to this particular Denny's to reinforce our theories about the locals in Port St. Lucie. We came up with various ideas on why the people there just seemed a little less than 100%. Rick Rickman works batting preactice REAL HARD! After seeing a 65 year old female sheriff with loaded gun in holster, a cook at the Denny's with loaded gun in holster, some really terrible dentistry, drunken outbursts from mother to child on more than one occasion, seriously odd facial and physical features, and a crack addict surprising us while unloading our gear next to the hotel saying, " no hit, no hit, you drive me, thanks, no hit", we both decided this place had been invaded by aliens and we would have to lie low in order to avoid abduction. After all the excitement was over for the night and all responses to Sports Shooter message boards were sent Rick and I headed out for our second game. As was done before we threw up our remotes and photographed the players batting practice. It was another night game this time vs. the Houston Astros. I made sure not to say anything to anyone except for the guy that was looking at me funny in the men's room. Many members of the Japanese media were there to cover the Mets' Kazou Matsui. They complimented us on our remote set up and D2H's. Near the 6th inning Roger Cedeno came up to bat and sent a foul ball sailing towards our home plate remote. I had to think quick it was either me or the camera, but since it was my lens mounted on the camera I threw my hand in front of the precious Nikon glass and was able to deflect the ball with my thumb. After some realignment we were back on track. The night was done and again we walked away with good images and the Mets walked away with another win. We got to bed quickly and ate in the hotel as to avoid the aliens. Thursday was our last and final game and the Mets played the World Champion Marlins in Jupiter, Florida. It was a day game, and the only one that we got to cover but it was great fun. By now I was setting up the remotes by myself practically and getting the hang of firing three cameras at once. The game ended in a tie and again we rapped up a successful trip. As we drove out of the parking lot Rick glanced down at the gages on the car and realize that we were about to pull a Mangin. We were almost out of gas, so much so that the gas light was on and the car was beeping at us. Luckily we found a gas station and were able to avoid the troubles that plagued Brad's spring training adventure. We got back to the hotel, packed our bags, and had our victory meal of top sirloin. We had an early flight to catch the next morning and a long day ahead of us. It was my first time covering a professional baseball game as a photographer and as an assistant. I learned and saw many things I'll never forget last week. Some might think of it as just another couple of days on the job, but this last week was my first trip to the majors on more than one level.